To address the ongoing global biodiversity crisis, governments have set strategic objectives and have adopted indicators to monitor progress toward their achievement. Projecting the likely impacts on biodiversity of different policy decisions allows decision makers to understand if and how these targets can be met. We projected trends in two widely used indicators of population abundance Geometric Mean Abundance, equivalent to the Living Planet Index and extinction risk (the Red List Index) under different climate and land-use change scenarios. Testing these on terrestrial carnivore and ungulate species, we found that both indicators decline steadily, and by 2050, under a Business-as-usual (BAU) scenario, geometric mean population abundance declines by 18�% while extinction risk increases for 8�% of the species, depending on assumptions about species responses to climate change. BAU will therefore fail Convention on Biological Diversity target 12 of improving the conservation status of known threatened species. 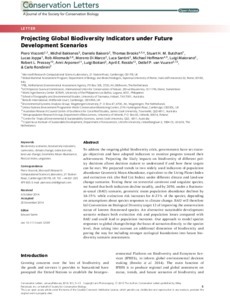 An alternative sustainable development scenario reduces both extinction risk and population losses compared with BAU and could lead to population increases. Our approach to model species responses to global changes brings the focus of scenarios directly to the species level, thus taking into account an additional dimension of biodiversity and paving the way for including stronger ecological foundations into future biodiversity scenario assessments.